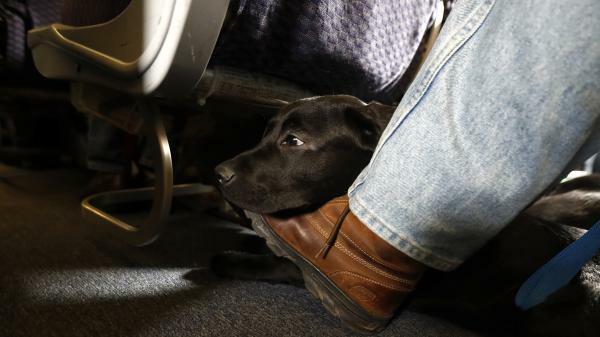 A service dog named Orlando rests on the foot of its trainer, John Reddan, while sitting inside a United Airlines plane at Newark Liberty International Airport during a training exercise last year. United Airlines wants to see more paperwork before passengers fly with an emotional support animal. We all need a little emotional support or comforting every now and then. And for many of us, our animals can provide it. Some of us with severe anxiety, phobias, PTSD or other disabilities cannot travel without them. But one woman took the notion of needing a comfort animal a little too far when trying to bring her rather large peacock, Dexter, onboard a United Airlines flight at Newark's Liberty Airport Sunday. United said no. "When a customer thinks that it's OK to show up at the airport after we've told them multiple times that we wouldn't accept the peacock, I think it becomes a point where action needs to be taken," says Charlie Hobart, a spokesman for United. "It illustrates ... to everyone why we need to revise this policy and why it's been getting out of hand." That policy, which allows service and support animals to accompany passengers on flights, is now being changed by United to require greater documentation about the need for the animal and to show that the animal has had adequate training, has all immunizations up to date and is in good health. Hobart says the changes were in the works long before Sunday's peacock incident, as United has seen a 75 percent year-over-year increase in the number of customers bringing emotional support animals onboard. The airline also has experienced a significant increase in onboard incidents involving these animals, including biting, aggression, urination, defecation, allergic reactions, conflict and other disruptions. "We can't continue going down this path where we continue to see customers who may be either loosely interpreting the policy or maybe even taking advantage of it to the detriment of folks who legitimately need to bring emotional support animals onboard," says Hobart. He adds the airline also needs to look out for the interests of other customers "who just want to enjoy a safe and comfortable travel experience and may not be able to do that when their seatmate has an untrained animal next to them." Under the changes, passengers traveling with emotional support animals will be required to notify the airline's Accessibility Desk at least 48 hours in advance, and they'll also need to provide a letter signed by a mental health professional indicating the passenger's need to travel with an emotional support animal. In addition, "the customer must provide confirmation that the animal has been trained to behave properly in a public setting and acknowledge responsibility for the animal's behavior," according to a statement from the airline. And "the customer must provide a health and vaccination form signed by the animal's veterinarian. The veterinarian must also affirm that there is no reason to believe that the animal will pose a direct threat to the health and safety of others on the aircraft or cause a significant disruption in service." The union representing United's flight attendants, who often are faced with refereeing conflicts over animals in flights or cleaning up after them, is applauding the policy changes. "[The Association of Flight Attendants] recognizes that service animals play a vital role in the lives of people with disabilities. ... [But] passengers who attempt to evade air transport pet policies by falsely claiming their pet is an emotional support animal cause safety, health and security issues in the cabin," the flight attendants said in a statement. United's action follows similar policy changes announced Jan. 19 at Delta Airlines, which says it carries about 700 service or support animals daily — nearly 250,000 annually. In a statement, Delta said, "Customers have attempted to fly with comfort turkeys, gliding possums known as sugar gliders, snakes, spiders and more." Both airlines point to the Transportation Department inaction on calls to implement clearer and more stringent guidelines on service and comfort animals as the reason for their own policy changes, which will go into effect March 1. A spokeswoman for American Airlines says the airline is "reviewing our requirements with the goal of protecting our team members and our customers who have a real need for a trained service or support animal. Unfortunately, untrained animals can lead to safety issues for our team, our passengers and working dogs onboard our aircraft. We will continue to support the rights of customers, from veterans to people with disabilities, with legitimate needs."